Two Saturdays ago, I was nursing two sick boys at home. My 7-year-old son was still recuperating from an upper respiratory tract infection, while hubby was suffering from a terrible headache followed by vomiting. Because we were without a helper then, I was the only one who could go out to get medicines for my boys and food for the three of us since there’s no more time to cook. I bought Lumpiang Shanghai and Kaldereta at Goldilocks for my boys’ dinner, while I got Pinoy Paella Rice for myself. I’ve been eyeing this Pinoy Paella Rice for the longest time, and the thought that I could finally taste it gave me a hint of happiness amidst the family emergencies we’re having at home. I didn’t take photos of my boys’ dinner fare, though, because I only intended to blog about Goldilocks Pinoy Paella Rice. 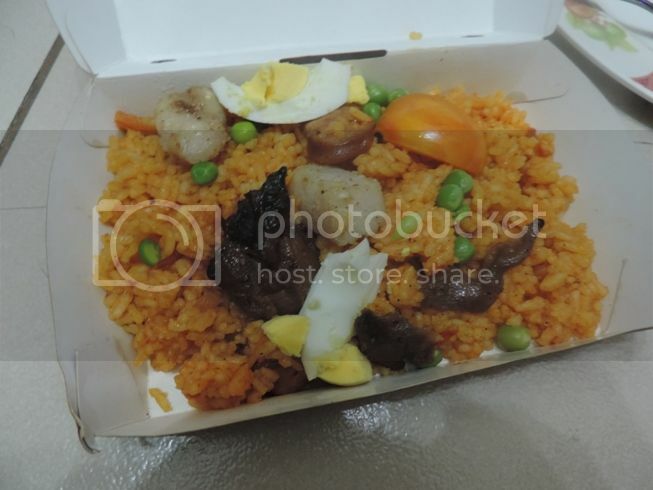 Goldilocks Pinoy Paella Rice is a rice dish with fish, meat, grilled chicken, vegetables, and eggs. With all the toppings in this Pinoy Paella Rice, I could say that the price of Php95.00 is reasonable. I also liked the grilled chicken— which I believe is the star ingredient in this rice dish— because it’s tender and well-seasoned. This paella is a bit salty, though, and because of that, I wasn’t really able to relish the individual flavors of the other ingredients. The next day, my boys were feeling so much better, and that surely made my day. Aside from that, hubby promised me a gift from Zalora which he said was my reward for taking care of him and our son. Thanks, hubs! You’re the best! This entry was posted in Goldilocks, Pinoy Paella Rice. Bookmark the permalink. I like Paella, I like this served in a hot pan pa because I like the burnt parts at the bottom haha.